With $246 billion in the bank, shrewdly deploying its mighty cash hoard is arguably Apple greatest financial opportunity. The problem of Apple's (NASDAQ:AAPL) cash balance is a "first-world problem" in the most literal sense of the phrase. Slightly larger than the annual economic output of Chile, Apple's cash and marketable securities stockpile lies largely overseas. As of the company's most recent earnings report, $230 billion of Apple's $246 billion, roughly 93%, was held in accounts controlled by Apple's international subsidiaries. Apple has caused quite a stir thanks to its controversial decision to park its foreign profits abroad rather than pay what it argues are onerous and unfair repatriation taxes. However, the whiff of tax policy overhaul percolating on Capitol Hill means this dynamic could soon change. In anticipation of such a scenario -- and in part because it's just fun to consider -- here are three realistic ways Apple could deploy its billions in the bank in the years ahead. Apple being a mature company, you often see investors float the idea of the Mac maker using its cash to fund a major acquisition whenever this discussion appears. The idea isn't without merit, either, although it is more complex than it might seem on the surface for a few reasons. The first hurdle lies in correctly identifying a large company that jives with Apple's plans for its own future. In terms of companies that I (subjectively) think could conceivably pair well with Apple, only a handful of plausible candidates come to mind. Among them are Tesla (NASDAQ:TSLA), Netflix (NASDAQ:NFLX), and Comcast (NASDAQ:CMCSA) (NASDAQ: CMCSK), three legitimately viable options among publicly traded companies. We know Apple is interested in -- or possibly in the midst of -- developing an electric vehicle from the many leaks about its Project Titan, though we don't know much more than that. Tesla makes the most sense among automakers for a few reasons. Much like Apple, Tesla's mission is to fundamentally alter the industries in which it operates. Its headquarters in California would make working together simpler than coordinating across the country with Detroit. In a similar vein, Comcast and Netflix both cater to Apple's long-held desire to launch its own content streaming service. Apple's ability to secure content rights from major producers has been the main thorn in its side. Both Netflix and Comcast control considerable content rights, though Netflix is newer to this game. As such, owning either Comcast or Netflix could supply Apple with the negotiating leverage it needs to finally bring the required parties to the table. Unfortunately, acquiring any of these companies would require Apple pay a significant premium to their current prices, which could be particularly troubling for already-expensive stocks like Netflix and Tesla. There are also integration, cultural, and regulatory considerations that could make such a maneuver highly complex for Apple, though the idea isn't entirely without merit. Idea 2: More capital return? This comes from the "if it ain't broke, don't fix it" school of thought since Apple has thus far used its cash reserves to finance its dividends and share buybacks. To do so, Apple has cleverly used its overseas riches as collateral to borrow against to fund its massive capital return program to great effect. Apple has paid out a whopping $201 billion of its current $250 billion capital return program as of its most recent earnings report, including $15 billion in dividends and buybacks in its latest quarter (Q1 FY 2017). Apple generated $27 billion in operating cash flow last year, and its capex requirements are minimal -- $3 billion last quarter. This makes the status quo seem sustainable, although the recent rally in Apple stock makes this option increasingly less appealing. 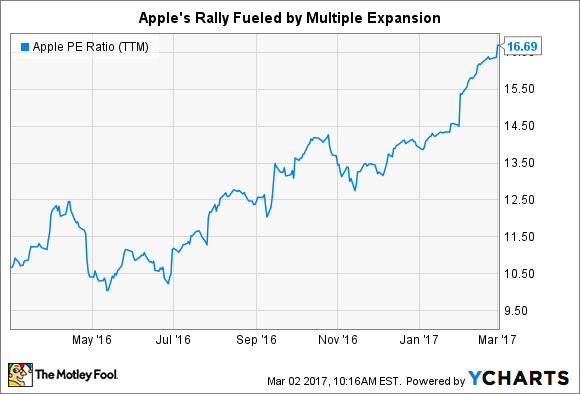 Stock buybacks become less effective as a company's valuation increases, so Apple's dramatic multiple expansion has made this tactic less attractive than it was a year ago. However, with Apple still trading at a discount to the market, and its cash balance rising, there's certainly a fair case to be made that further buybacks and dividends remain a worthy use of Apple's riches. Idea 3: Finance important capex? If Project Titan is indeed real, I think the chances of Apple implementing this third idea are quite strong. One of the most important questions Apple must answer along the way is how will it manufacture the electric vehicle? As I have noted in the past, automobile manufacturing is a capital-intensive, low-margin business. This leaves Apple facing a potential catch-22 with Project Titan, driving meaningful sales growth while also dramatically eroding its now-cushy profit margins in the process. Perhaps the best solution to this problem is to follow a tactic similar to Apple's contract manufacturing arrangements with Asian assembly specialists Foxconn. Apple designs products and maintains quality control, but it hands over the actual widget-making, the low-margin part of the process, to someone else. This is how the majority of Apple's consumer electronics get made today. The key speed bump with this idea is that there are no large-scale automotive contract manufacturers that exist today to provide this service to Apple, and that's where Apple's mountains of money come into play. Assuming it finds a willing and capable partner to build Project Titan, Apple could use its cash to finance the construction of the factory infrastructure necessary to bring Project Titan to life. In fact, Apple has pursued a similar strategy in the past. It partnered with the now-defunct GT Advanced Technologies to finance the construction of a factory that GT Advanced planned to use to produce commercial sapphire for Apple's fingerprint scanners. If it does so, Apple will want to take great care to avoid past mistakes, like bankrupting GT Advanced under the onerous terms of its financing deal. Regardless, this idea is sound as long as Apple's auto ambitions are indeed as real as portrayed in the media. Of course, this only scratches the surface in terms of possible uses of Apple's cash. U.S. tax policy overhaul will also have a significant influence on Apple's options, so interested investors will want to stay in tune with the national discussion around it in the coming months. At the end of the day, though, Apple's billions in the bank provide it with unparalleled flexibility to pursue any number of possible actions, and that's something in which Apple investors can and should find great comfort.